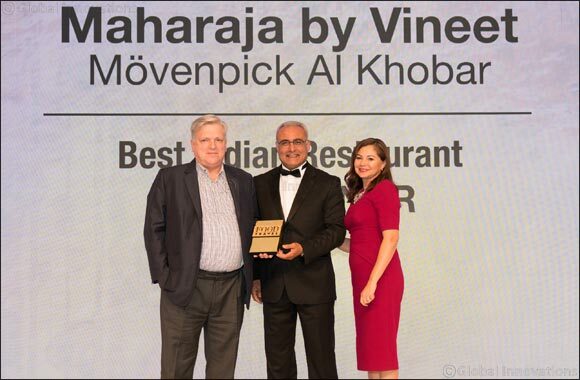 Al Khobar (Saudi Arabia), 11 April 2017 - Mövenpick Hotel Al Khobar’s signature restaurant, Maharaja by Vineet, has spiced up the 2017 Food & Travel Arabia GCC Awards where it was honoured as the ‘Best Indian Restaurant’ in the region. The restaurant, which is headed up by Michelin-starred Chef Vineet Bhatia, received the accolade at a glittering awards ceremony staged in Dubai recently, after thousands of diners declared it the Gulf’s best Indian dining experience. More than 1.1 million votes were cast to decide the winners of this year’s 2017 Food & Travel Arabia GCC Awards, confirming that Maharaja by Vineet is considered the region’s leading Indian dining destination. “Maharaja by Vineet serves a perfectly-crafted menu of innovative north-west Indian dishes, taking our guests on a gastronomic journey, thanks to the expertise of world-leading Indian chef, Vineet Bhatia,” said Peter Hoesli, General Manager, Mövenpick Hotel Al Khobar. The Food & Travel Arabia Awards call on diners from around the region to vote for “outstanding food and travel experiences”, based on cuisine, service and even culinary theatre. Maharaja by Vineet delivers on all three, inviting diners to explore north-western Indian cuisine in elegant and palatial surroundings, where dishes are brought to life through experiences that include live Tandoori cooking performances. Chef Vineet fuses traditional and modern Indian ingredients to create original flavours, catering to discerning palates from around the globe. This magical culinary journey is also guided by the restaurant’s expert culinary team, known for its exquisite service and expert knowledge of the cuisine, ingredients and preparation methods. “It’s this attention to detail that sets Maharaja by Vineet apart from the crowd as an award-winning restaurant,” added Hoesli.